*This made enough for three adult salads, plus a little meat for hubbyman to take a salad with him today for lunch. I had all that steak leftover from the yakiniku, so I cut 1lb (mine was a black Angus round steak) of the steak into strips. Cook over med-high heat with the cider vinegar, add the spices as well. 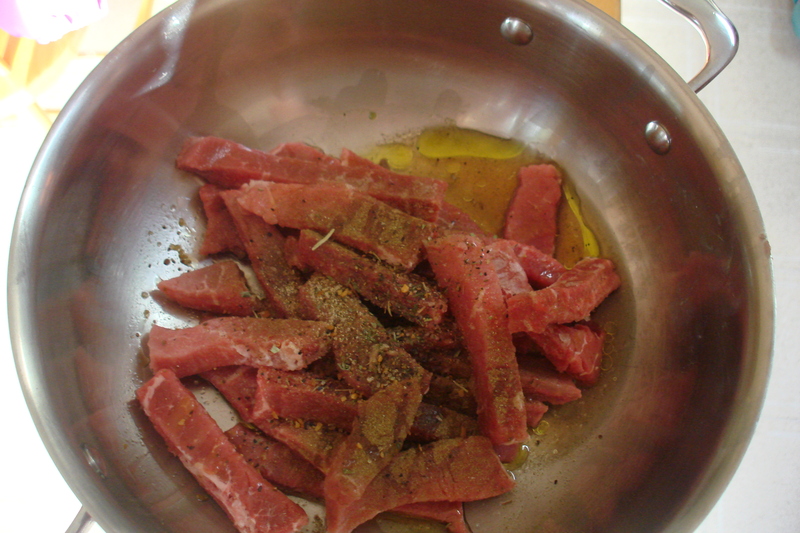 I love thyme and peppered steaks. You can of course add in whatever your favorite seasonings are. Because the rest of the salad’s ingredients are sweet, I wanted the steak’s flavor to contrast. 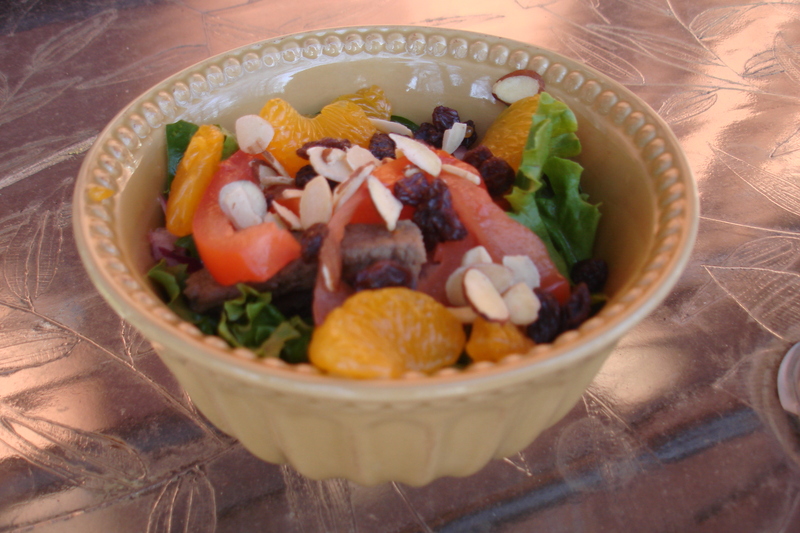 When steak was done, I threw in the lettuce and spinach, followed by the onions, tomatoes, raisins, and almonds. I topped it off with the oranges. You can of course do it in whatever order you want, with whatever toppings you want. Add in some, take something out… whatever! 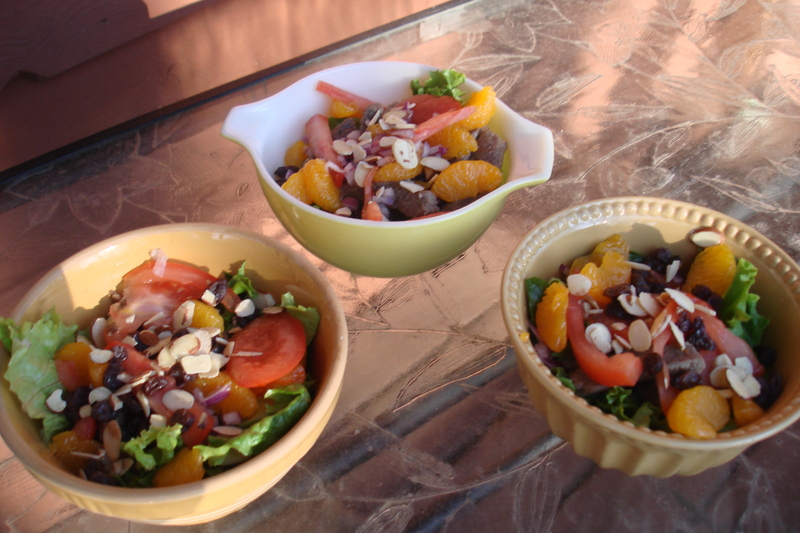 There is so much flavor in this salad that I did not use a dressing, just a little olive oil drizzled over. Perfect! So yummy! Even the big hungry men said that it was terrific! Don’t they look delicious? And all that color! To me it just says delicious, sunshine, and happiness. Or those words in any order! I could truly eat a salad every day! Especially when they’re as flavor full as these! Hubbyman says he never knew “rabbit food” could taste good until my salads! And today it is finally nice enough that the kids can be out on the deck playing (which they love! ), and I’m thinking it is looking like a great night for grilling!! I had some things I was going to blab blog about, but I think that instead I will join my children out on the deck! With the sunshine salad I’m having for lunch, of course! What meal “screams” sunshine to you? So today I actually got my house totally cleaned! organized ok, ok, so it’s picked up, at least to the naked eye, or more accurately, or at least hopefully, to the visiting eye! Things are where they’re supposed to be, beds are made, and toys were put away… and although I didn’t have time to mop the kitchen floor, I did get vacuuming done (upstairs). That counts for something, right? 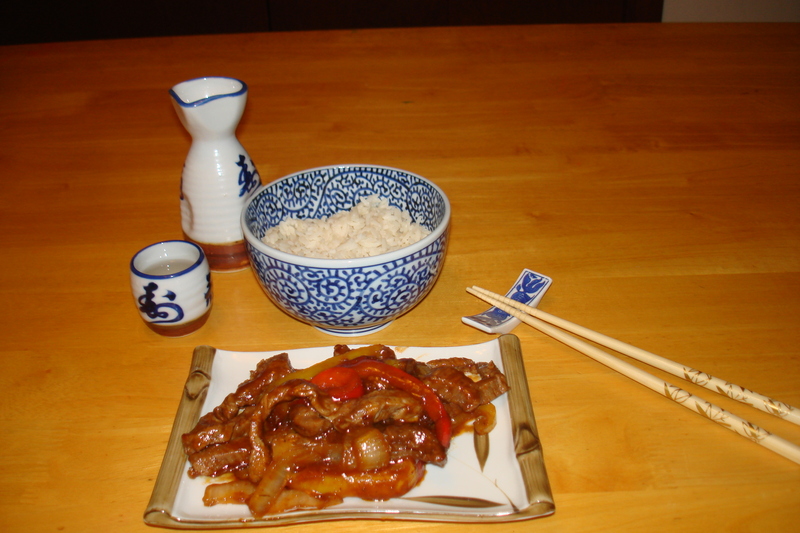 Back when hubby-man was also a military-man he did a deployment to Japan, where he fell in love with Korean bbq. When he came home he insisted on learning how to replicate it. And it was time well spent! This is another one of those meals that can look -and taste- like you spent a lot of time and money on it, but neither is true. And ooooh is it yummy! 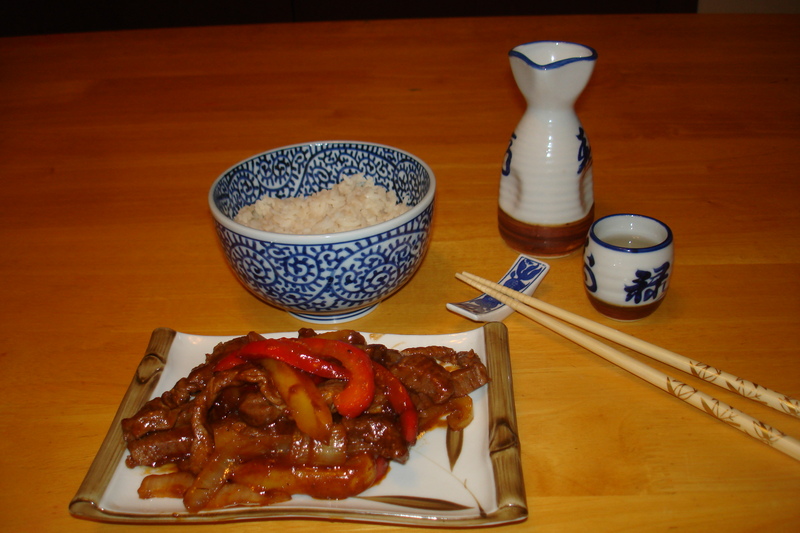 Hubby-man loves this recipe for crowd-feeding! I think he secretly loves that he makes it and therefore everyone oohs and aahhs over his culinary abilities. (I love that I’m not doing the cooking!) Plus, then we get to use all the fun things purchased in Japan! And I’m down for any reason to get out (and use) the Sake set! Something about the miniture scale of it all just makes me feel like a little girl at a tea party! I love it! Just talking about it has made me realize that it’s lunch time, I’m hungry, and there’s a dish of it set aside specifically for my lunch! I highly suggest you try it! Sooo good! 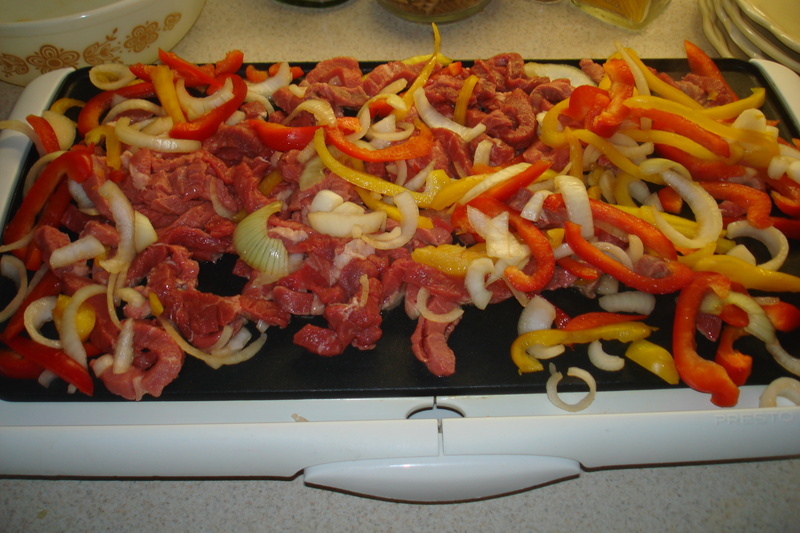 Slice the beef, peppers, and onions in thin strips. We realized upon cutting it up that it was a ton of food! And our guests ended up dropping off our nephew while they ran some errands. Which worked out perfectly because YAY LEFTOVERS!! So what we did was cook half and froze (the already sliced everything) the other half. So next time we’re thinking that it sounds good, or get unexpected company, no trips to the store will be necessary, we’ll just whip it out of the freezer and voila! You should also know that I LOOOVE peppers and so there’s nothing sparing about the amount of vegetables put in here. You could also add lots of other things, peas, mushrooms, broccoli… (those are things I’d like to try adding in). Plus, if you wanted to make it without meat, it would still be delicious! 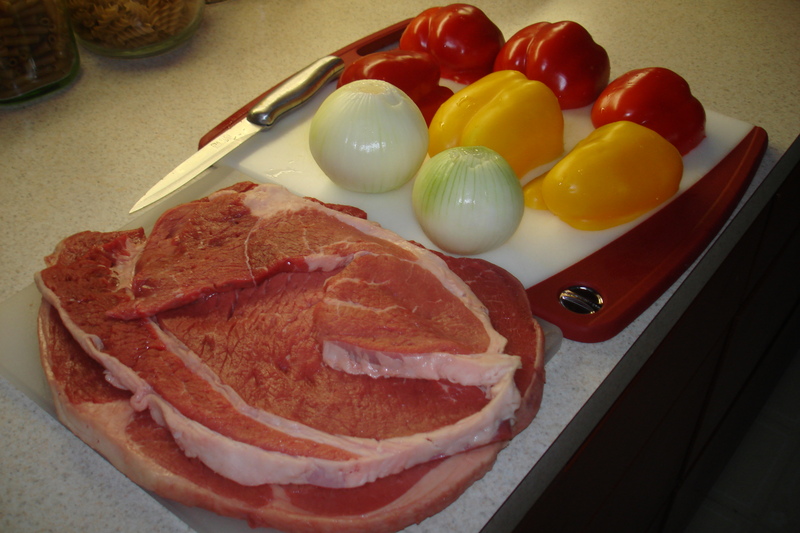 This is a good recipe to cook with more than one person, or do the slicing in advance. So that either one person slices while the other makes the sauce, or you’ve got it all prepared in advance and can make the sauce and you’re good to go. Either way. I throw the onion, garlic, and spring onions in the food processor, but you can simply just finely chop them. Place in a saucepan with wine (or white wine vinegar) and cook for about 3 minutes while stirring fairly frequently. Add in the sea salt, honey, sesame oil, and lemon juice and cook for another minute. Let it cool and then add the sesame seeds.